I have been stalking the Spelling You See website for about a year now and trying to get a copy up here in Canada. The program has exceeded my expectations and the results have been amazing! I’m pretty much addicted to this homeschool spelling curriculum! It is bright, cheery, and a revolutionary approach to spelling! Take a look at what sets this program apart. What is Spelling You See? 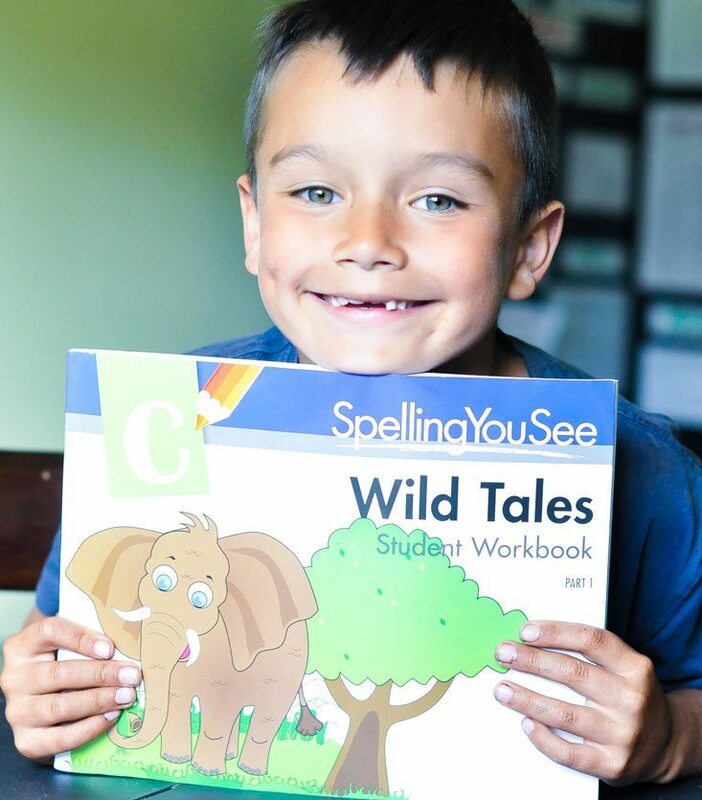 Spelling You See is a unique curriculum that teaches along with the developmental stages of language development. The lessons are segregated into short daily excerpts that integrate copywork, color cues, visual memory and more! It is a research based program that is vastly different from traditional spelling programs on the market. 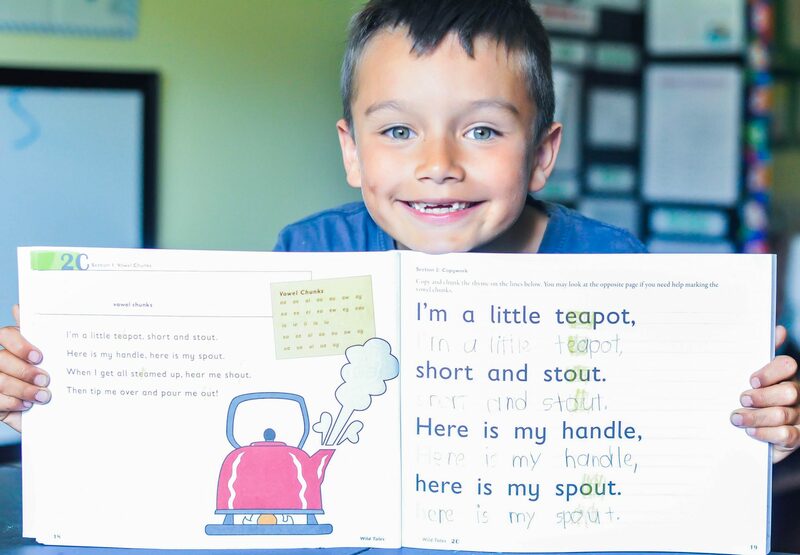 Whereas most spelling programs involve lists you memorize throughout the week, Spelling You See connects spelling in long term memory with copywork, reading, speaking, and listening (great for a variety of learning styles!). With Spelling You See, the words are introduced in rhymes or writing passages. As the children work with the passage they learn and remember the formation of the word! What did we love about Spelling You See? First of all, my son (grade 2) LOVED this program. He found it simple, fun, not too overwhelming and was excited to do it each day. He loved the erasable color pencils and it was easy to get him to do his spelling. We “test” his spelling by having impromptu dinner spelling bee’s as a family and his spelling, printing, and writing skills have just exploded. Because of the design of the program, we have eliminated copywork from our schedule and he loves that we are doing both aspects in one book! It takes him anywhere from 5-10 minutes to do his spelling and it has been a super easy transition for us as a family. The program is US based, which means that some of the words will be different. However in the early elementary I haven’t run into a word yet that was spelled differently so I have not had any issues using it as a Canadian spelling resource. If we did run into a problem I would just adjust the word within the book before he started his lesson. We love the simplicity of the program and I love the results. As a busy homeschool mom with an insane amount of things to do in a day, the fact that he can do it himself without assistance pretty much makes me their biggest fan. I am SUPER impressed and am really really hoping they make a Canadian version for the later levels. I think incorporating Social’s into our reading, printing, and spelling program would make me a diehard Spelling You See advocate (wink wink, nudge nudge). A Spelling Curriculum that Works! I can’t even begin to tell you the change we have seen in Caleb’s writing and reading skills through this program. And it has all come to pass with no tears or whining from my little man or nagging from me! This spelling program works and I really can’t imagine going back to boring spelling lists! I am SUPER hopeful that this gets released in Canada as I would absolutely buy it for every child in my family. I think it is an amazing resource and the fact that it combines so many facets of learning into one make it a real gem and one you won’t regret buying. I think level B would work best for my daughter. I’ve been lurking around this program for awhile myself. We’ve used Math U See for several years. I’d love a look at Wild Tales myself to see what it’s like. It looks really good! It’s VERY different than Math U See, written by someone else entirely, but I’m with you. Once you love a company you want to see what other great products they have created! Good luck! I’d love A and B for both my boys, but I guess starting with A would be awesome! I think I’d put my daughter in level C – Wild Tales. She heading into 3rd and seems to be a natural speller, and is a fluent reader. But her writing skills are not up to level D yet. I think C would be a gentle enough for her. We would need leave a and the ancient one. Which I am blanking on lol. So excited this is open to Canada. Thanks. I would start with level A. This looks like a great program! I’ve just recently heard about this program and would love to try it on my weak spellers. We love Math U See so I would love to try this program. Probably level D or E.
New to this program. I would love to try it with my children, especially my daughter who is dyslexic. I would choose level C. What an awesome giveaway!! This looks great! Level C would work for us. We would love level F. Thank you for this giveaway! My daughter has been wanting to try a spelling program, and this one looks like it might be a good fit. She would be level C.
We’re just finishing up with Jack and Jill and my son loves it. I would love either C to continue with him or A to start with my 5 year old daughter. A lot of people would be very excited if this program became available in Canada, especially if it were adapted to Canadian spelling. It looks like the social content would need to be changed to make it relevant to Canadian homeschoolers as well. Regardless, I’ve heard lot of people wondering how to buy it in Canada. Does the program consist of instructor’s manuals and workbooks? I guess I was assuming that it worked with manipulatives (like AAS) because of Math-U-See’s awesome manipulatives. I’m guessing my daughter’s level would be D or E.
You can buy it in Canada by calling the sales department. The only down side is exchange and cross border shipping (unless u have a box across the border like we do). level A as we are just beginning our homeschool journey. We LOVE spelling you see. Almost done level B. Since majority of Books are published in the states, I plan on using any differences in spelling as a learning tool to show the difference between Canadian and US spelling. We need level C now, but shipping and exchange are ridiculous. Need our Canadian Math-u-see rep to be sent this curriculum for Canadians to purchase. I love Math U See and from what I hear, I think Spelling You See would be a good fit for my kiddos. This looks like a great program! Level A would definitely work best for us. I think my daughter would be at level D. Thank you for the review and giveaway! My daughter is at level C. Thanks for the review and giveaway–this is great! I think we would loooove Wild Tales Level C! D & E. My daughter loves American History and also struggles with spelling. Actually she gets A’s in spelling, but when writing independently struggles. I would like to give her a foundation that goes beyond lists and short term memorization..
We would love to have level E. Thanks for the chance to win! I think Level A – Listen and Write would be a perfect starting point for my daughter! i believe I would start with level one. We are right on the boarder for level two. I think there would be an advantage to starting at the beginning of a curriculum that is new to us. My son has just turned 5 so I would choose the first level to start with. Hi, I’m a looking at either Wild Cats or Americana I think. I need to have my childe take the dictation portion on the website to determine exactly which. My children have dyslexia and I am having a difficult time getting my son to learn how to spell even the easiest of words. I would love to be able to find something that can help him learn his spelling and love doing it at the same time. I am looking at Level B Jack and Jill. Would love to try this out. We are just new to Homeschooling so still trying to learn all the different ways to learn and all the different curriculums! I would love Wild tales for my son! The reading and repetition would help so much with his spelling! We don’t mind the us spellings as I have taught both to our boys since I am a montana girl living in Alberta! Level D sounds right for my dd. We have loved Math U See and this looks intriguing! I think A would be perfect for my sons and C for my DD. Would be awesome to win this! I’m a newbie blogger and am having so much fun visiting all the blogs in the community to see what its all about! Your blog is great! We actually just came across Spelling You See in our looking out for new resources to try. We’d LOVE to win and incorporate something fun into our homeschool day. 🙂 Thanks for the chance! Thanks for this reveiw Rebecca, I see you have included it in your plan for 15-16 and I will post this in the fall as a learning sample. I would love to give Spelling You See a try! Being in Canada shipping and the exchange rate make for a rather expensive spelling program, so I would love to win it! I want to use level C for my daughters. Level B seems to be where we are at right now. This is exactly like what I was looking at do for the fall. Actually, this program seems to be even better. I’ve had my eye on Level D for a while now. Will fit perfectly with next year’s History! We’d love to win this! We’re new homeschoolers and this would be great! I would LOVE to use SYS with my sons next school year! This approach to spelling just makes so much sense to me! Level C would be perfect,… this is excellent, very worthwhile and helpful. Hey where do you order it from? Thinking it would work well for my girls!